Selling your home can be an exciting - yet stressful – process. However, selling your home during the winter months presents its own unique set of challenges. Besides the basic de-cluttering and storing of items no longer in use, home sellers are faced with a typically slower real estate market, as well as the holidays, which can sometimes make it difficult to decide whether to decorate or properly showcase your home for sale. Also, some people just do not like to go outside and brave the elements if they absolutely do not have to. On the positive side, however, home buyers during this time tend to be more serious and are not just browsing. If you do decide to list your home during the winter months, take advantage of this time by thoroughly preparing your home for sale to entice visitors to brave the elements and preview your home. Following these 6 home staging tips will prepare your guests to be warm and cozy inside, even while the temperatures may be cold outside. What visitors first see upon driving up to your home sets the tone for the rest of the visit. First impressions are formed within a matter of seconds, so make sure your home has great curb appeal. Part of this starts with the basics. Ensure your visitors have an easy and safe pathway to view your home. This means the driveway, walkways and steps all need to be de-iced and shoveled. Any covered porches or small seating areas should also be cleared. Without clear accessibility to your home, visitors will simply move onto the next home. Adding a few potted evergreens, spruces, or shrubs, for example, will also help to create an element of “life” into your entry and walkway areas. Also by adding a seasonal or decorative wreath on the front door along with a plain door mat, you are indicating your guests are invited inside your home. Make sure your home is set to at least 70 degrees Fahrenheit or higher during showings. Visitors do not like to hang out in a chilly home and will not want to stay long if the home is not at a comfortable temperature. Help your visitors forget about the cold outside and focus what's on the inside. Having a toasty environment may result in visitors wanting to linger in the home longer and potentially fall in love. We know the downside of winter is that there is always extra gear to put on - coats, boots, mittens, scarves, etc. And with that comes finding a place to store all these accessories. Ideally these items should be stored neatly in hall or mudroom closets, but anyone who lives in a cold-weather state knows that is not always the case. Taking some time to organize closets and store items not in use will leave little doubt to visitors that there is plenty of storage space. Clearing out the front closet also offers visitors a place to take their coats and shoes off while touring your home, as well as feel comfortable when they walk inside. During these bleak and dreary winter months, lighting becomes more important than ever to showcase your home's best features. The best way to garner light is to not only keep all drapery and curtains open to allow maximum natural light, but also cleaning exterior and interior windows clean as much as possible. A commonplace problem with homeowners is having ample lighting. Adding extra levels of lighting, such as table and floor lamps also helps set a mood an ambiance for your visitors. It is not enough to just rely on the fixed ceiling lights for lighting. Also keep all lighting on during a showing, whether day or night, because this too, also helps to play an important part of the home's overall presentation. Using white or off-white colored drapery panels not only helps to frame in the window, but can visually lighten up the room in areas where lighting may be more limited. 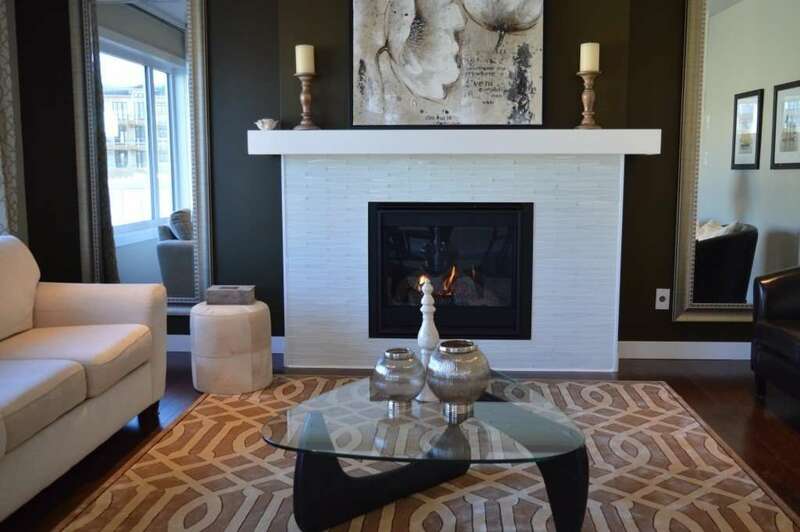 Nothing says cozy more than a fireplace, especially in a living or family room. If you have one, make sure to keep it on during showings. As a home seller, you want to appeal to the buyer's senses, and a fireplace will immediately command that sense of cozy, warmth, and relaxation. Adding seasonal décor to the fireplace mantle area with metallic finishes, cozy throws or faux-fur blankets to the sofa, or natural elements like birch or pine to the coffee table, for example, helps to enhance the senses and create a lasting memory point. Although it is important for some to decorate for the holiday, it is necessary to keep in mind that any holiday decorating needs to be tasteful and minimal. Remember, you are not selling your decorations – you are selling your home. My rule of thumb is to only bring out decorations after a home's online photos have been published and to specifically store any religious or potentially kitschy holiday items away during any showings. However, any décor pieces in neutrals, whites or metallics, or organic are acceptable to keep out because there is less of a chance they will not offend your visitors. There you have it – 6 home staging tips to consider before listing your home for sale during the winter months. Taking the time to do some extra preparation of your home now may result in a faster sale and at a higher price than you expected.